Will Green has come off his contract at Brackley to sign for Brakes. Will Green has made his switch to Leamington permanent after coming off his contract at Brackley Town. 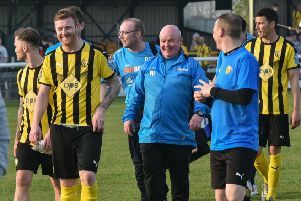 Green joined Leamington on loan in August, having had a previous spell at the New Windmill, and despite the striker primarily being used off the bench, manager Paul Holleran was delighted to secure the services of the 22-year-old. “He’s been a little bit in and out but he’s still effective when games open up,” said Holleran. “He’ll have a big role to play as the season progresses and he gives depth to the squad. “He’s still a young boy and he’s the right kind of character - he gives us options. Green, who counts Bedford, Oxford City and Daventry Town among his former clubs, has scored twice for Brakes this term and joins on a non-contract basis.